Acetyl L-Carnitine is not an amino acid in the strict sense, it is used by the body to transport long chain fatty acids to the mitochondria in the cells, where it is burned for energy. 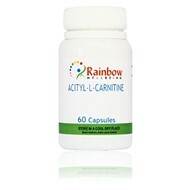 It is useful for anyone, such as athletes, who want to increase muscle strength and energy or burn fat more efficiently. It works well together with Alpha-Lipoic Acid to improve energy levels. Take 2 vegetable capsules a day, more in times of extra need.